19.25'' in length and 9.75'' in width. 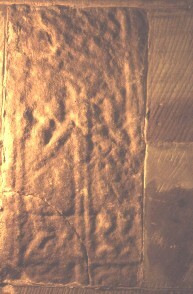 This stone shows two human figures facing each other, with what may be the trunk of a tree between them. They have been identified as Adam and Eve by some commentators. The top of the stone may represent the foliage of the tree and there is a possible serpent's head seen on the right side. However it has also been suggested that these two figures could represent two of the Apostles with interlace above them. The full shaft of the Cross may have shown all twelve Apostles arranged in pairs (? ).